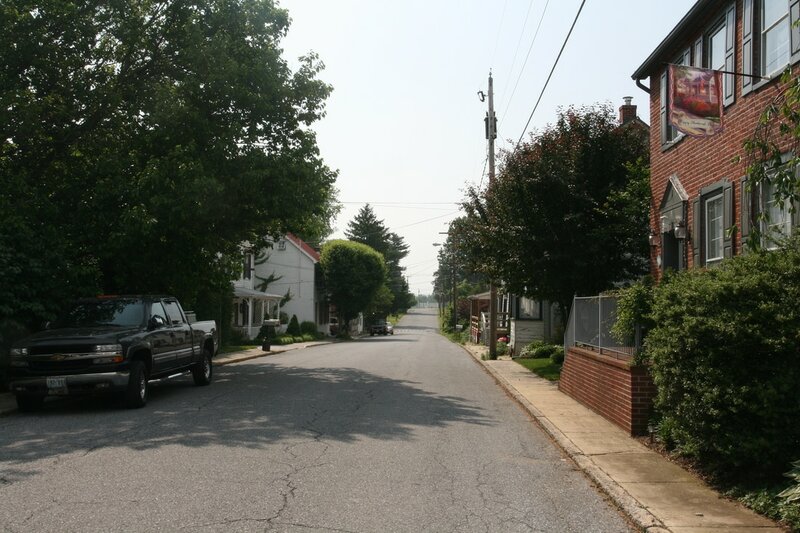 Burkittsville prides itself on the well-preserved integrity of its historic structures and landscape. The village has seen very little modern construction since 1900 and contains many structures were built between the 1820s and the American Civil War. When we compare historic views of the town and its houses and public buildings, we are impressed by the similarities and intrigued by the subtle differences that a few decades or even a century can have. Explore a few of these juxtaposed views in the gallery below featuring historic photographs from the collections of South Mountain Heritage Society and contemporary images of the same scenes and buildings. Click on any of the photographs to enlarge them for easier viewing​. Among the earliest known photographs of Burkittsville is this postcard estimated to date to the turn of the 20th century. The view up West Main Street at the square corner shows some of Burkittsville's oldest commercial structures as well as the first glimpses of modern technology (notice the telegraph line pole visible to the right in the photograph). Some of the structures visible in this image include the Horine's General Store (on the left side of the street), Guyton's General Store (on the right side) and the Rev. Emmanuel Slifer House and tailor shop (immediate right). The wrought iron fence visible at the lower right corner spanned the churchyard in front of Resurrection Reformed Church (South Mountain Heritage Society). When this historic postcard image was taken around 1910, Burkittsville's East Main Street was the site of several cottage industries including blacksmiths and the cobbler shop of Casper and Clara Pfiefer who lived in the house on the right side of the photograph (with the four women seen on the porch). 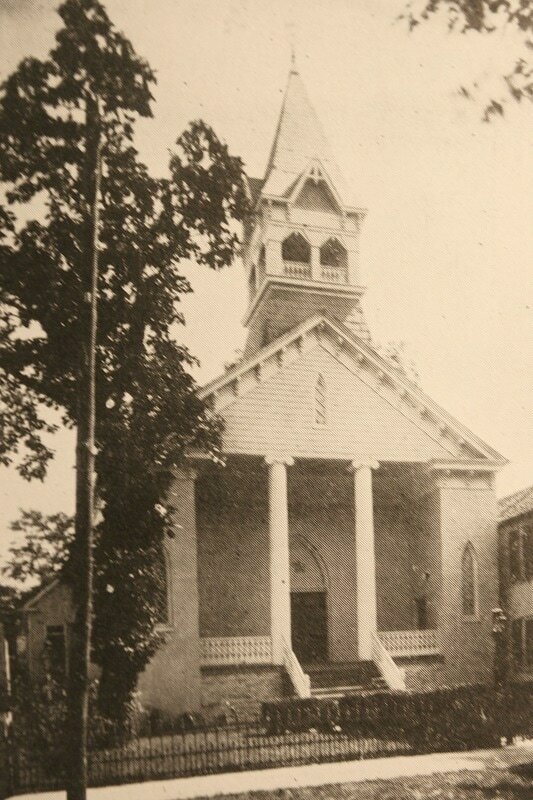 Close inspection of the left side of the photograph reveals the base of the stone walls and the doorsteps of the former "Union Chapel," built in the mid-19th century as a Methodist Episcopal Church and later used as a community hall and meeting place for Burkittsville's chapter of the Junior Order of United American Mechanics. The building was torn down in the mid-20th century and is the site of a parking lot today. 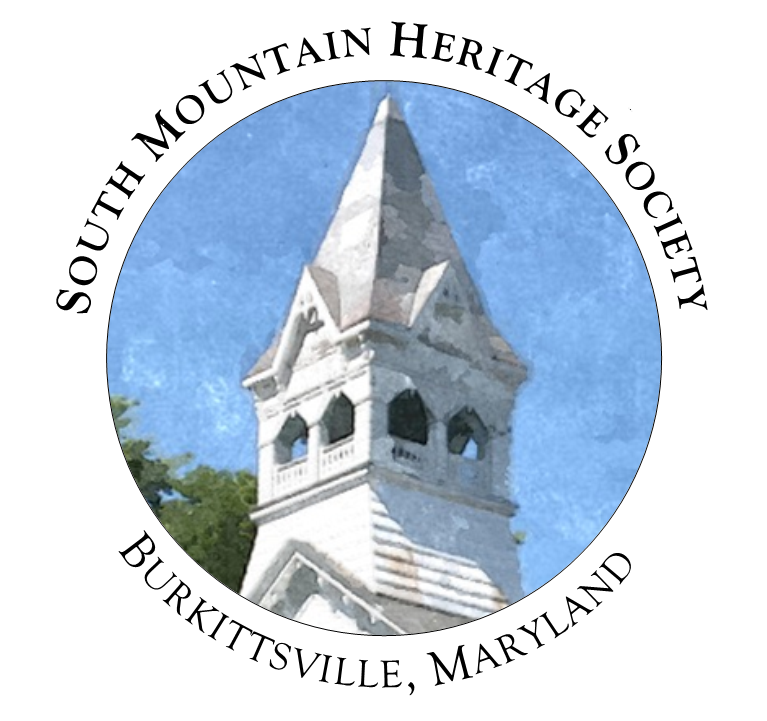 Burkittsville founder Henry Burkitt purchased the "Friends Goodwill" tract in 1807. 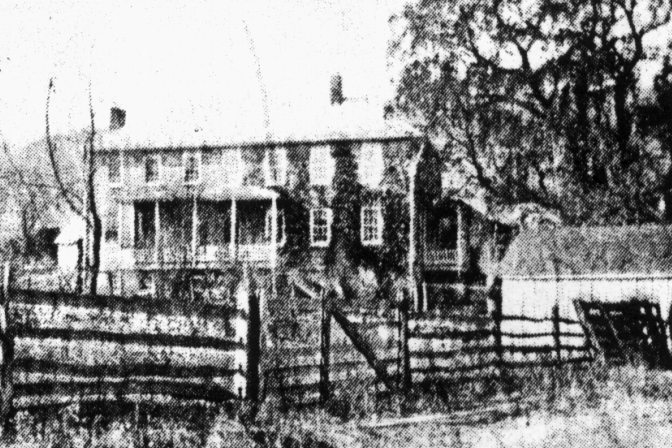 At least a portion of the present house is believed to have been standing when Burkitt moved to the area from Bucks County, Pennsylvania. The large dwelling dominates the center of the village and is the still the center of a working farm today. 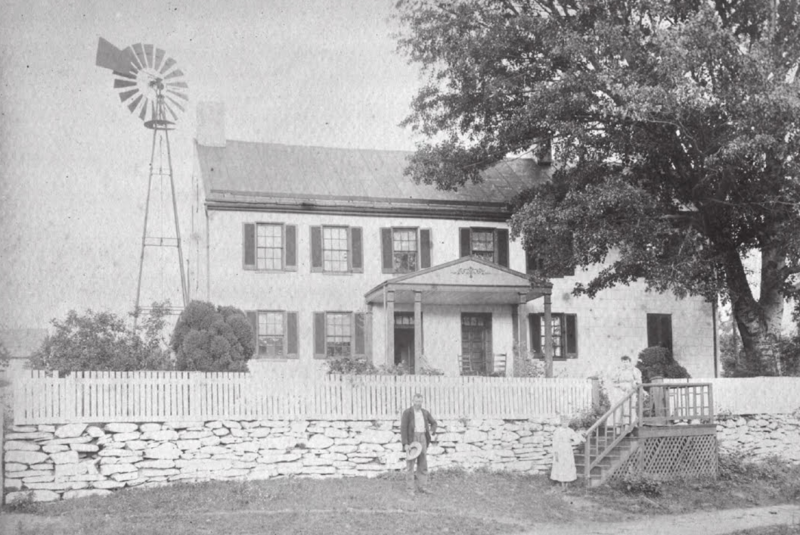 The historic photograph of the house shows the early Greek Revival-styled porch and a stone retaining wall which no longer exists today. Friends Goodwill, like many historic homes in Burkittsville, was redecorated in the Victorian Era with the addition of a cross-gable and the long porch with Queen Anne-styled "gingerbread." In 1789, Peter Gaver purchased a tract of land which encompassing most of the western-half of the future village of Burkittsville which he named "Gaver's Recovery." In the mid-19th century, the Arnold family acquired the farm and expanded the house, originally a side-hall dwelling of two-stories. 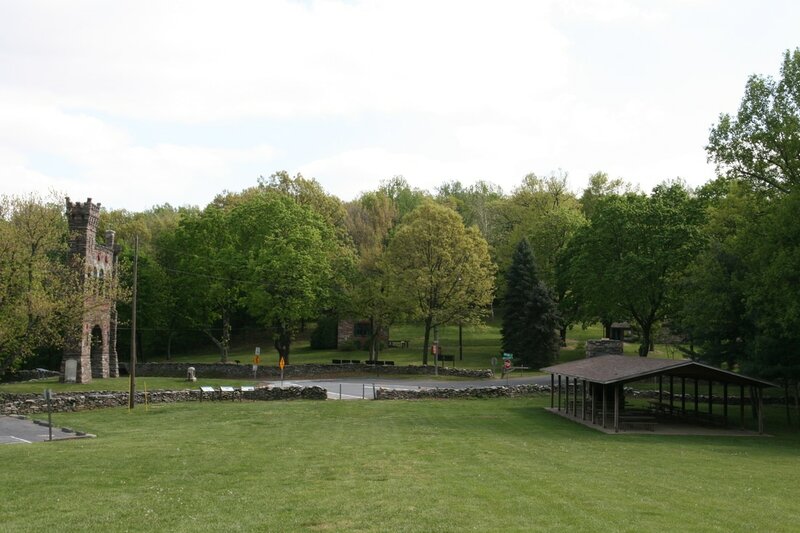 During the Battle of South Mountain, the Arnold Farm became a staging area for the United States Army's units as they prepared to ascend the mountainside and push the Confederate forces out of Crampton's Gap. Sharpshooters used the farm's large bank barn for cover. The house may have also been used to shelter wounded soldiers in the weeks after the battle. The farm remained in the Arnold family until the late-1960s. 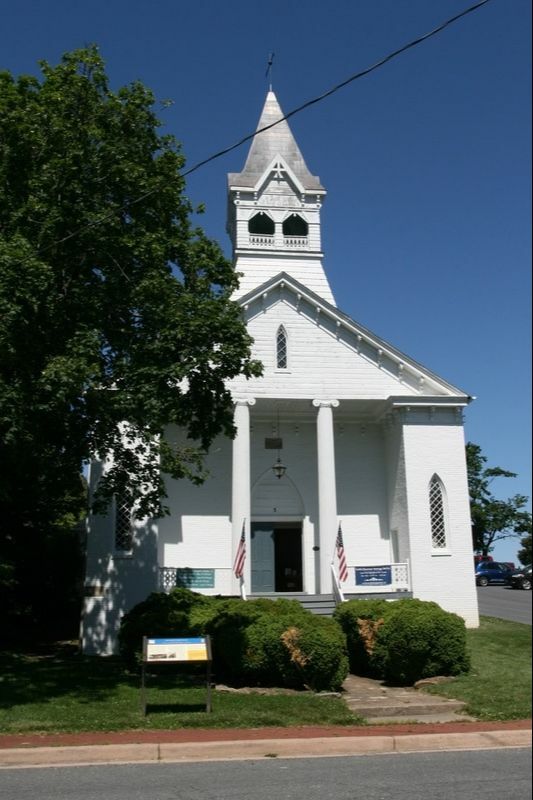 Burkittsville's oldest public building is the historic Resurrection Reformed Church. 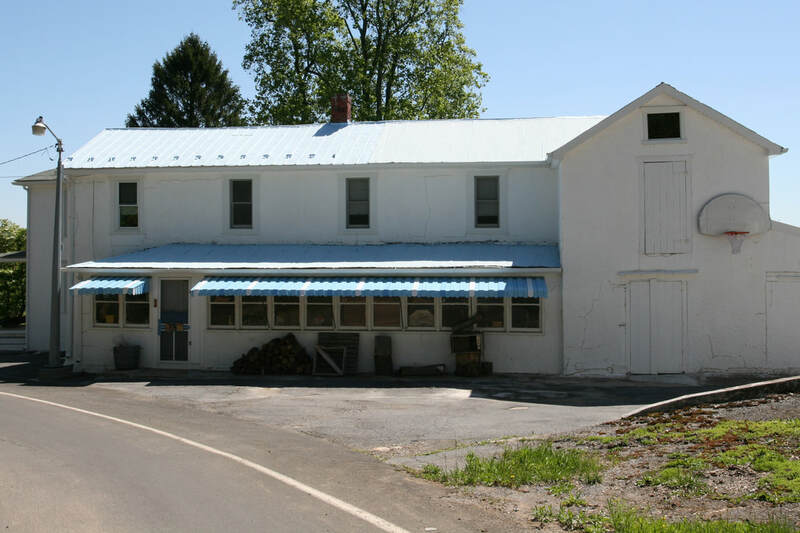 Members of the German Reformed faith began worshiping at the Willard Farm (today the Distillery Lane Ciderworks) in the early 1800s, served by ministers who traveled from Middletown to administer the services. 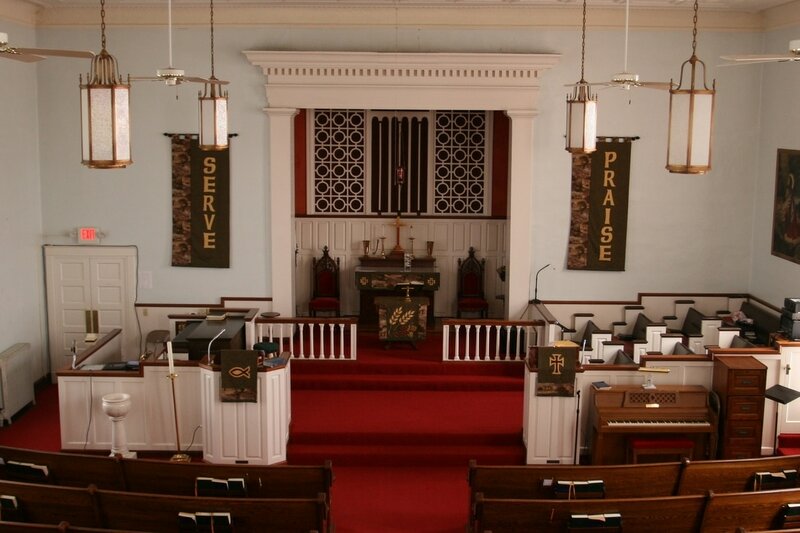 In 1829, the Reformed Congregation joined with the Lutherans to build a Union Church. This building still stands today, though much altered. After sharing the building for 30 years, the Lutherans moved into their own church (see St. Paul's Lutheran Church below) and the Reformed congregation rebuilt their structure, adding the Greek Revival-styled distyle-in-antis portico and the Gothic-styled windows. The building was used as a field hospital following the Battle of South Mountain from September 14, 1862 until January 31, 1863. The Reformed congregation, saddled with debt at the onset of the Civil War, took several decades to recover from the damages inflicted to the building during its use as a hospital. 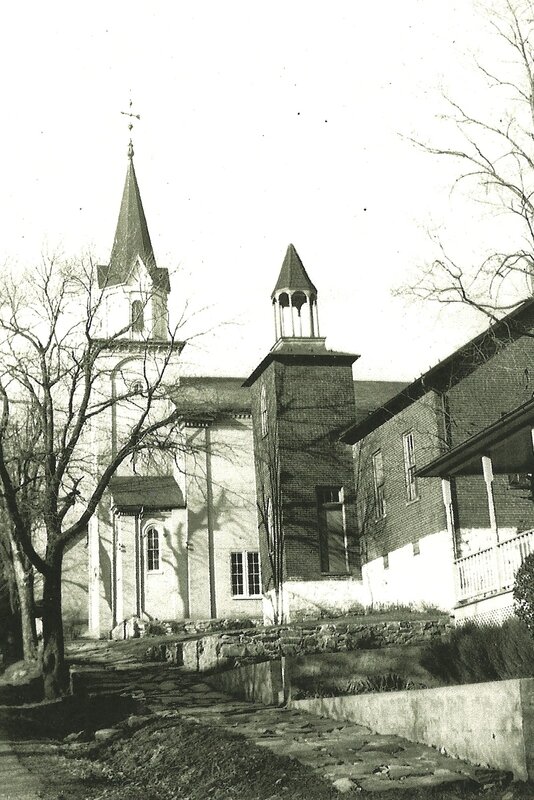 In the 1890s, the building was expanded with the addition of a Sunday School chapel on the back of the church. Further renovations in 1896 included the addition of the distinctive Queen Anne-styled belfry and redecorating the sanctuary with frescoes and new chancel furnishings (altar, pulpit, lectern, celebrant's chairs, and font). 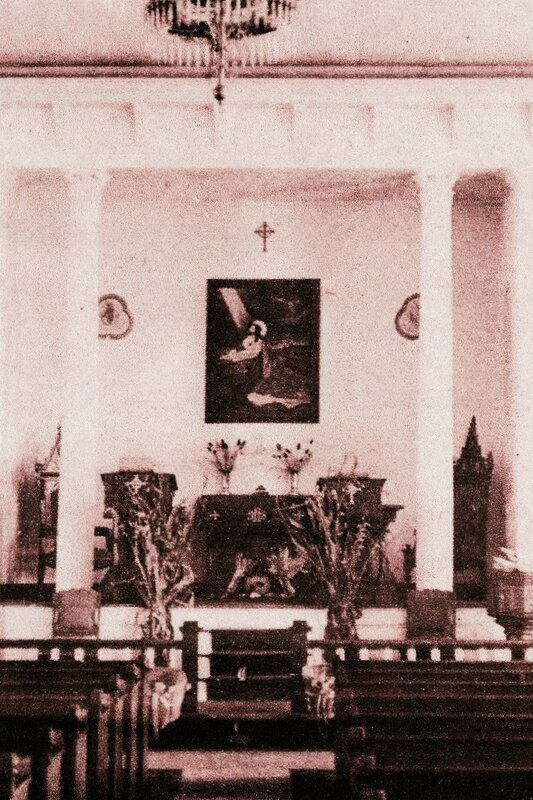 The historic image above was taken in 1979 when the Resurrection Reformed Church held its last service. After the building was acquired by South Mountain Heritage Society in the early-1990s, the church was restored to its 1896 appearance. 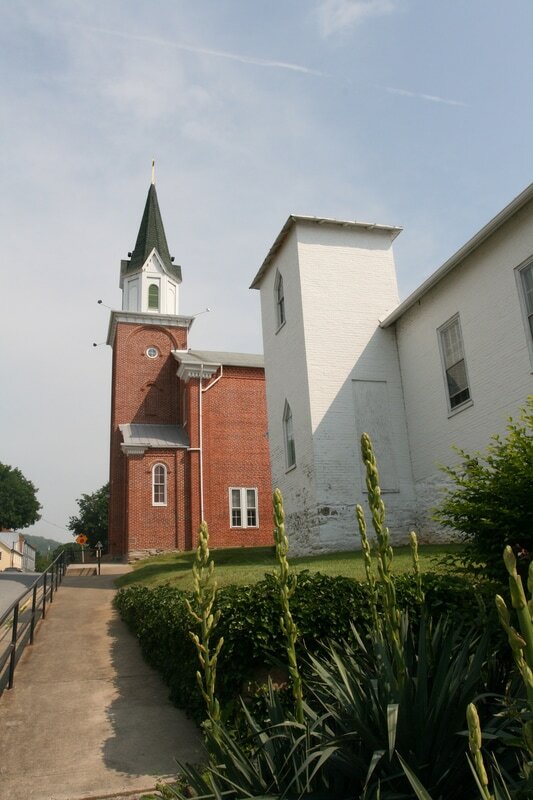 Lutherans began gathering for worship in the Karn Cabinet Shop on the east end of Burkittsville in the early-1800s. 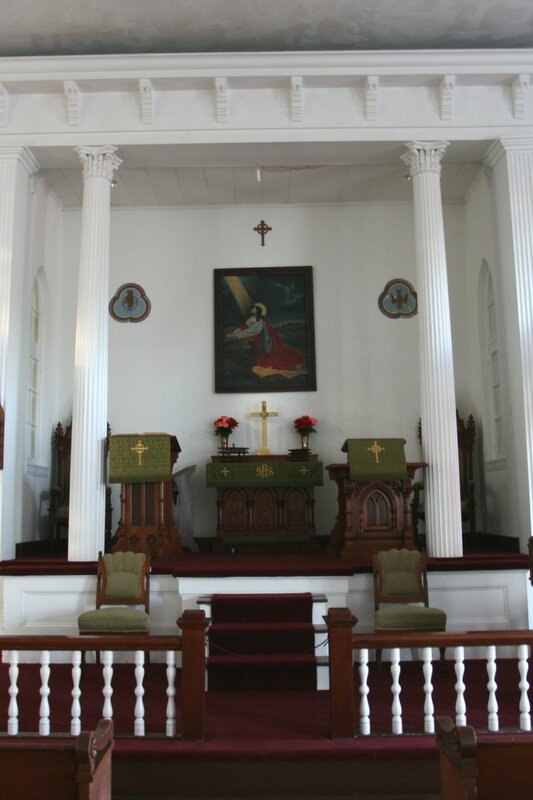 After worshiping jointly with the Reformed congregation in the Union Church from 1829 to 1859, the Lutherans erected their own church just before the Civil War. The two-story brick structure included a Sunday School lecture hall on the ground level and the sanctuary on the second floor. Along with the Reformed Church and a dozen other buildings in town, St. Paul's Church was used as a field hospital after the Battle of South Mountain. The neighboring schoolhouse, built around the same time as the church, was also used to house wounded soldiers. The present tower and spire were added during renovations in the 1870s and are modeled on St. John's Lutheran Church in Hagerstown, Maryland. The interior of St. Paul's Lutheran Church has changed quite dramatically over its 150 year history. 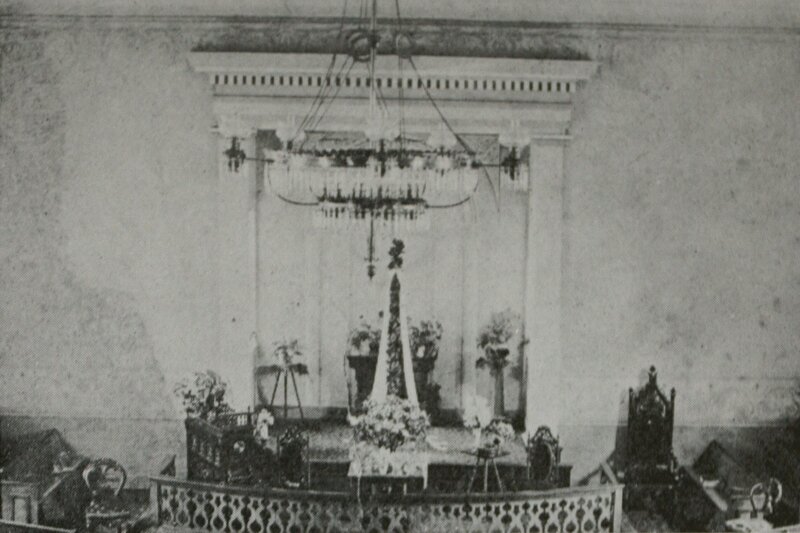 The historic photograph shows the interior of the church prior to the addition of a pipe organ built by the Moller Company of Hagerstown, Maryland, in 1914. When the organ was originally installed in the church, its pipes were visible and it dominated the center of the chancel. The present sanctuary, decorated in Colonial Revival style, was completed in 1964. Some of the historic features of the sanctuary are still intact today, such as the Greek Revival-styled cornice with dentil trim work. During the 1964 renovations, the pipe organ was rebuilt and moved behind the decorative screen above the altar. Many historic photographs of Burkittsville show the dense tree canopy that once covered Main Street. 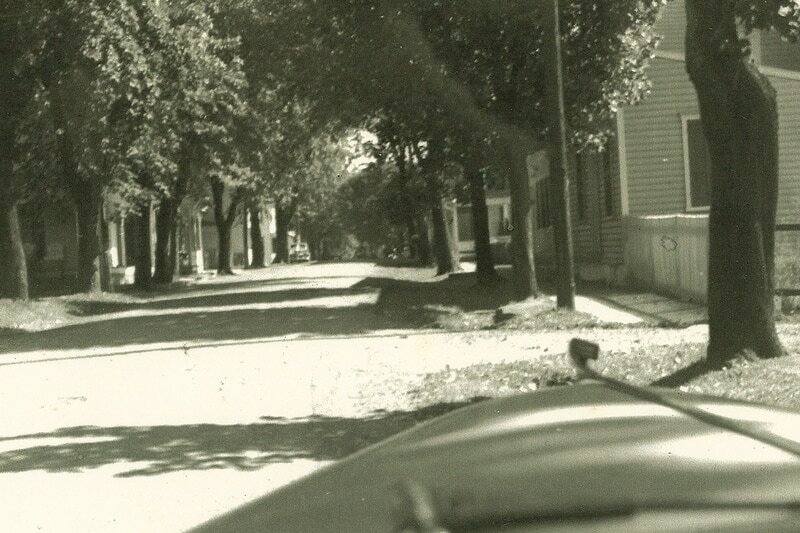 In the historic photograph of West Main Street, taken in the 1940s, one can barely see the houses for the thick foliage on either side of the street. The dwelling seen at the right of both images, historically known as "the Home Place," is one of Burkittsville's oldest structures. The rear ell wing of the house dates to the late-18th century and is constructed using half-timber framing, a building technique traced back to medieval Europe. Few structures employing this building technique remain in the region today. 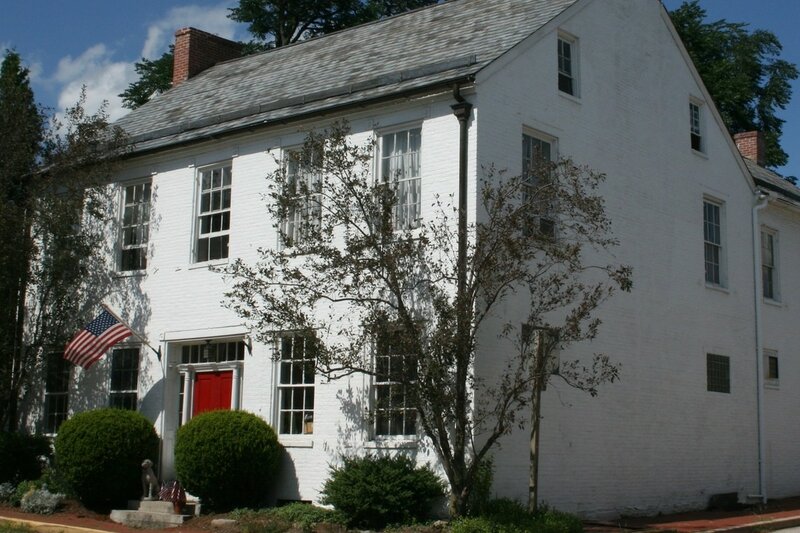 One of Burkittsville's earliest commercial structures, this Greek Revival-styled brick dwelling and store was constructed in the early-1820s and originally housed a tavern. From the time of the Civil War until the late-20th century, a general store was located here, operated successively by the Hightman, Huffer, and Guyton families. From the 1870s until the mid-1910s, the post office was operated here as well. Many local residents recall fond memories of Guyton's General Store, especially busy Friday nights when local railroad workers received their paychecks and the stores stayed open late. When Garland Guyton closed his business in the early-1980s, it was the last of Burkittsville's historic general stores to cease operation. 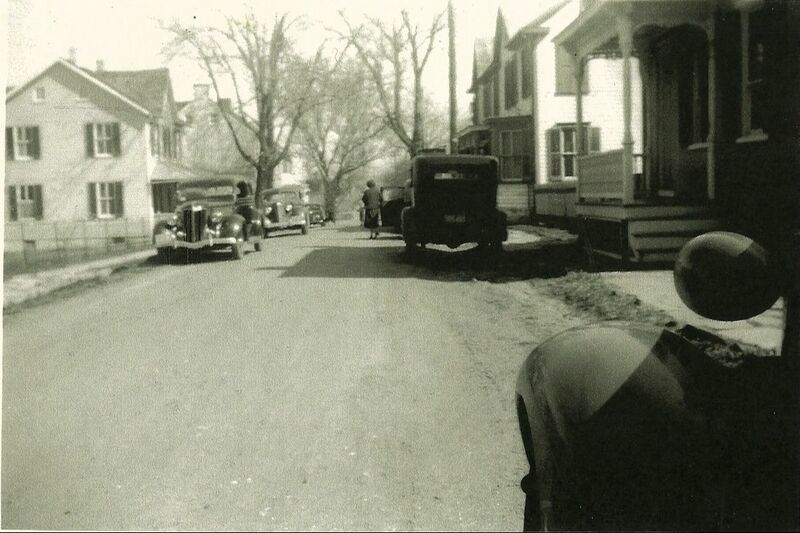 From buggies and carts to automobiles, the streetscape of Burkittsville changed dramatically in the 1920s and 30s as more town residents began purchasing their own cars. 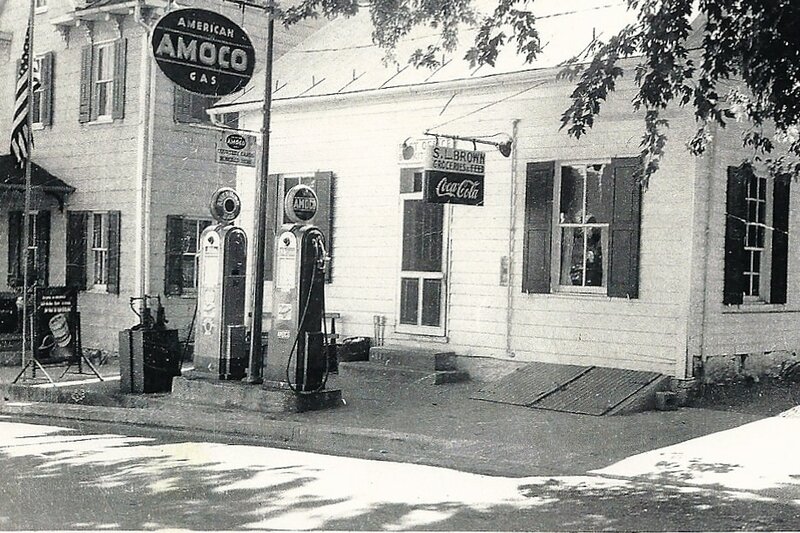 In the post-war era of the 1950s, all three general stores in Burkittsville sold gasoline at the street side and the town even had an auto repair garage. However, the increasingly mobile population also spelled the end for small town economies as people became more likely to drive to nearby Brunswick or Frederick to purchase goods from large chain retailers. 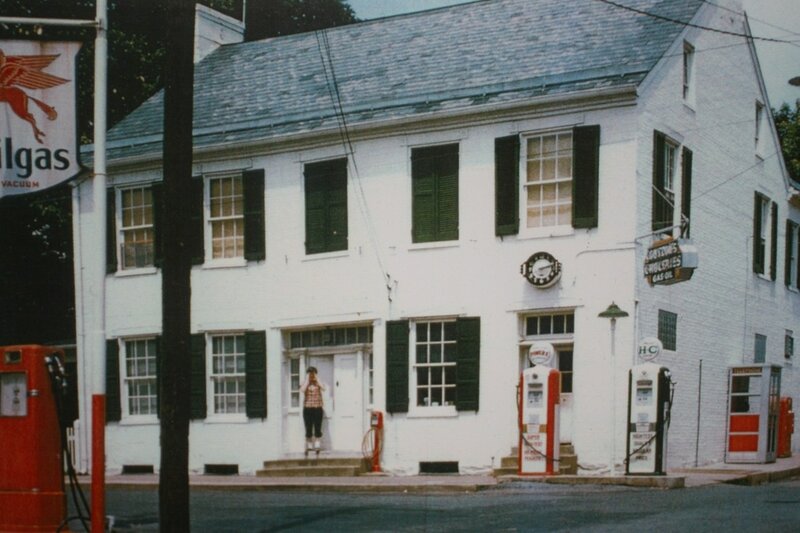 By the mid-1980s, all of Burkittsville's general stores had closed. 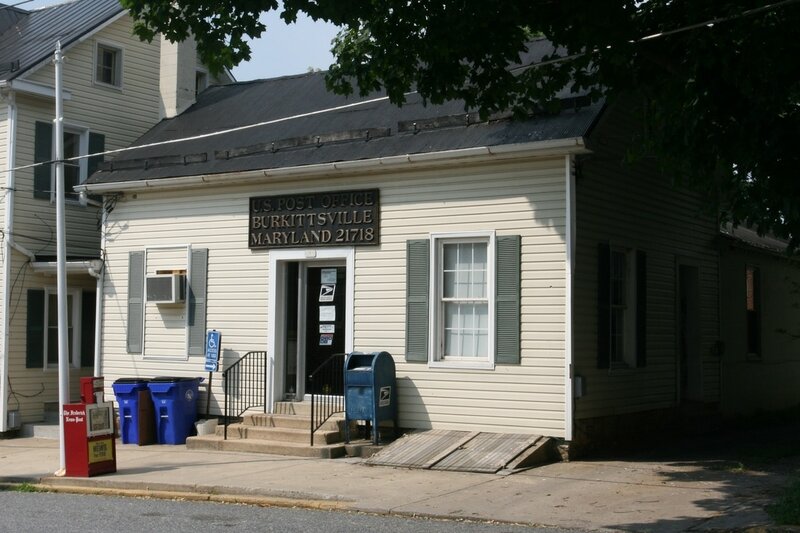 Burkittsville's post office was established in 1824 as "Harley's Post Office," named for the first postmaster, Joshua Harley. By 1830, the name was changed to "Burkittsville." Originally located in Harley's Store (today P.J. Gilligan's Mercantile Store), the post office often moved as postmasters changed. Many of the town's postmasters were also store keepers. In the mid-1910s, Irvin Magaha became postmaster when he opened his general store in this historic building. Two more general stores operated after Magaha's, including Samuel L. Brown's store (seen in the historic photograph), and George Karn, Jr.'s store, which closed in the mid-1970s. The post office remains in operation on this site today. Residents of Burkittsville petitioned Frederick County for several years in the early-20th century to have a new school built in the town. 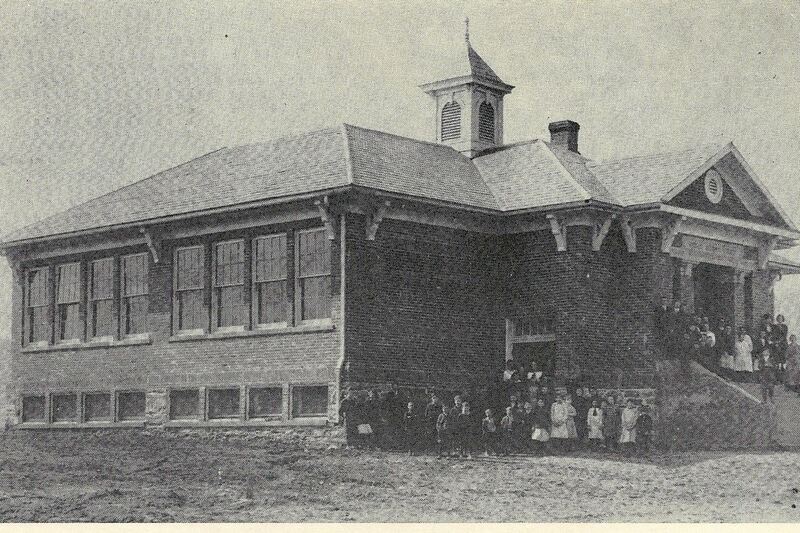 In 1914, a four-room brick school was constructed at the eastern edge of the village. The building burned four years after its construction and was rebuilt in 1918 to its present form (without the hipped room, decorative brackets, and cupola). 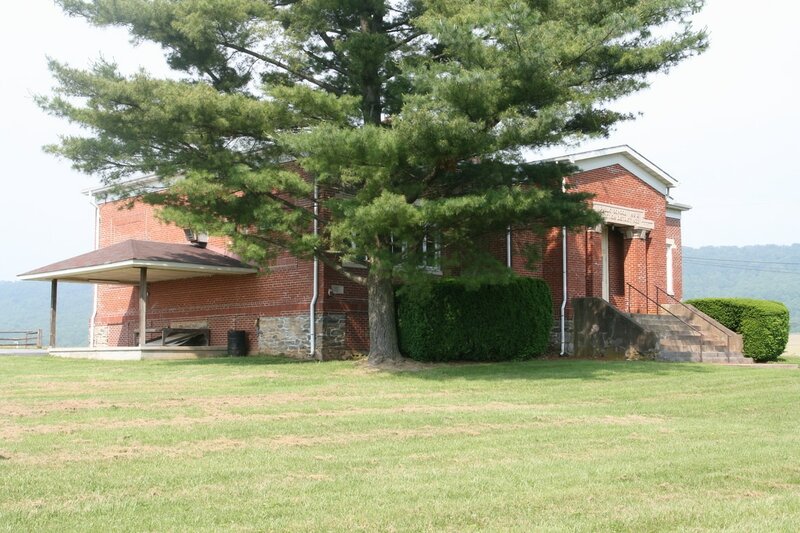 Students attended grades 1 through 6 in this building until 1968 when a new elementary school was built in nearby Jefferson and the Burkittsville school was closed. The Ruritan Club purchased the property at auction, restored the schoolhouse, and has used it as a meeting hall and community center ever since. 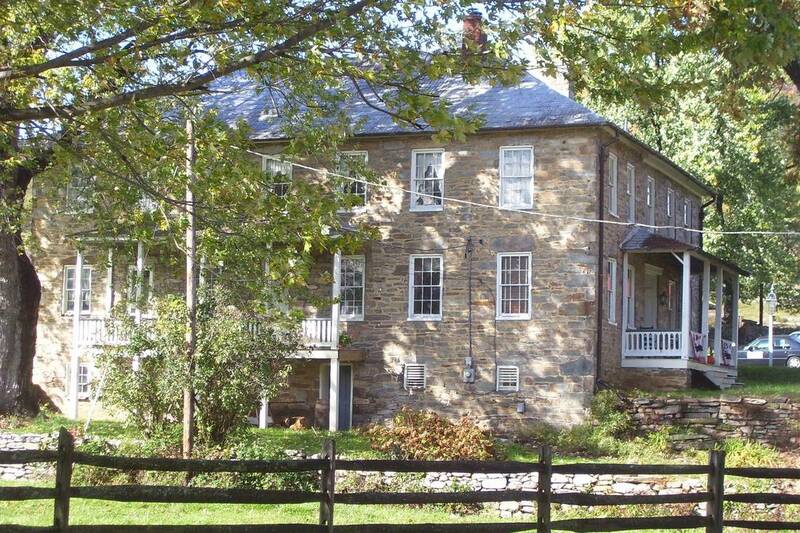 While writing his novel Katy of Catoctin in the 1880s, George Alfred Townsend, better known by his pen name, "Gath," began purchasing land atop South Mountain in Crampton's Gap to build a massive estate he called "Gapland." 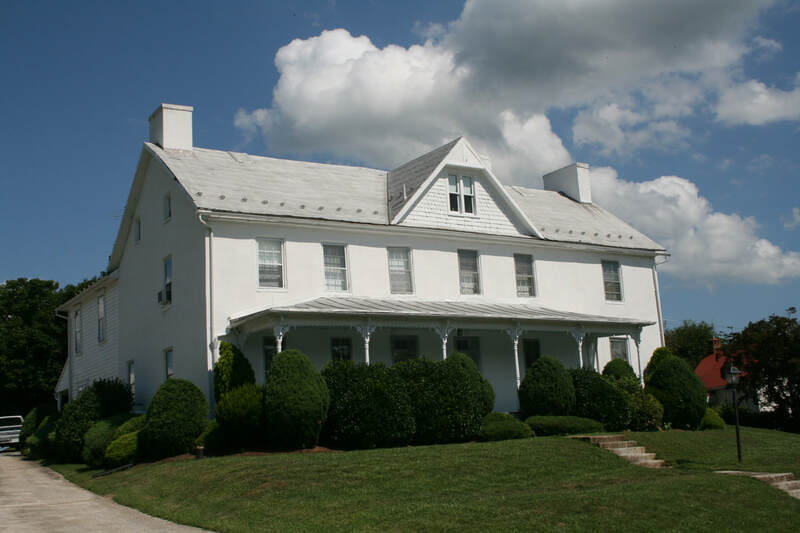 At its height, Gapland featured over a dozen residences, outbuildings, and monuments which brought hundreds of visitors to the Burkittsville area and employed dozens of local residents as house servants, cooks, and groundskeepers. The estate fell into ruin after Gath's death but was later acquired by the state in the 1960s and redeveloped into a park. 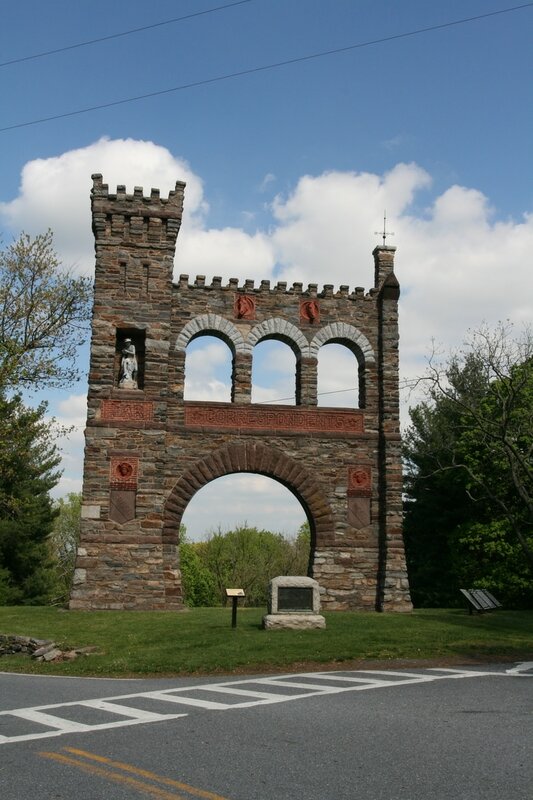 Gath's most enduring architectural legacy, the War Correspondence Memorial Arch, continues to awe visitors as they travel over South Mountain into Burkittsville over 120 years after its construction. 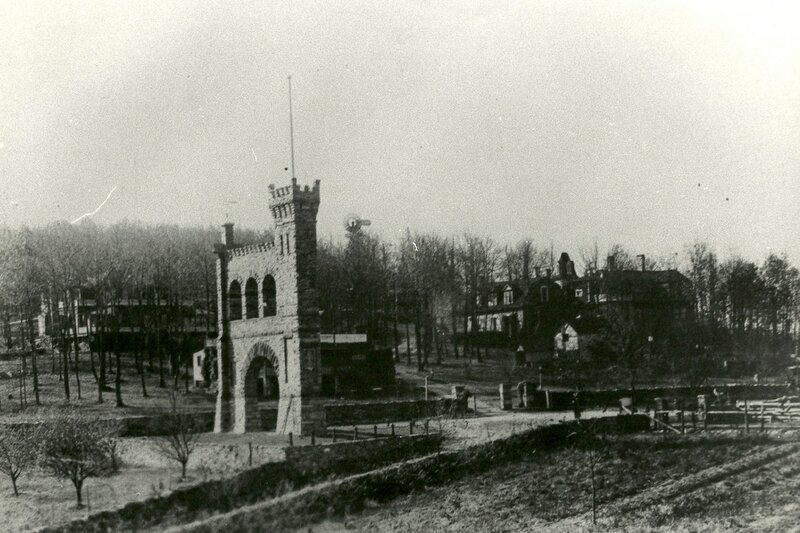 Having served as a correspondent in the American Civil War, Townsend used his own wealth and gifts from fellow authors and Victorian elites to fund the monument's construction. Its peculiar design is believed to have been based on elements of several structures in Hagerstown, Maryland where Gath often boarded trains for his travels. 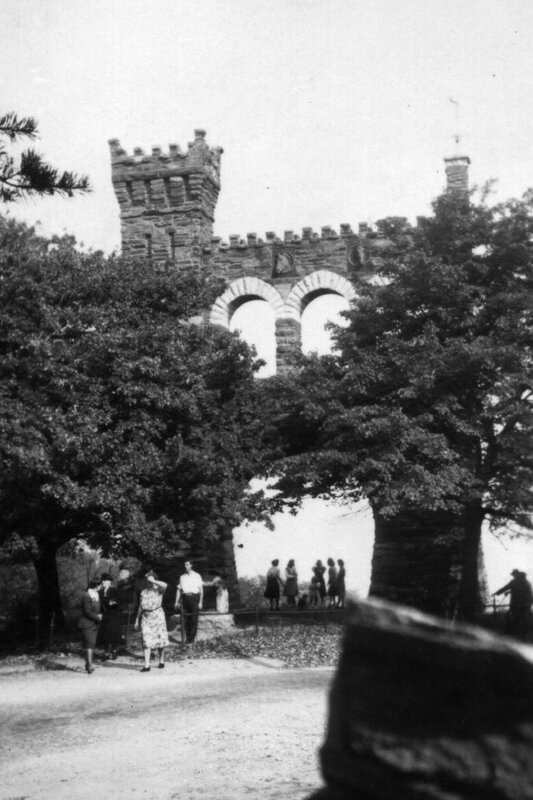 Unlike the rest of the estate that fell into ruin after Gath's death, the arch was deeded to the War Department and later acquired by the state of Maryland. Consequently, it has remained well preserved and continues to serve as an attraction today. 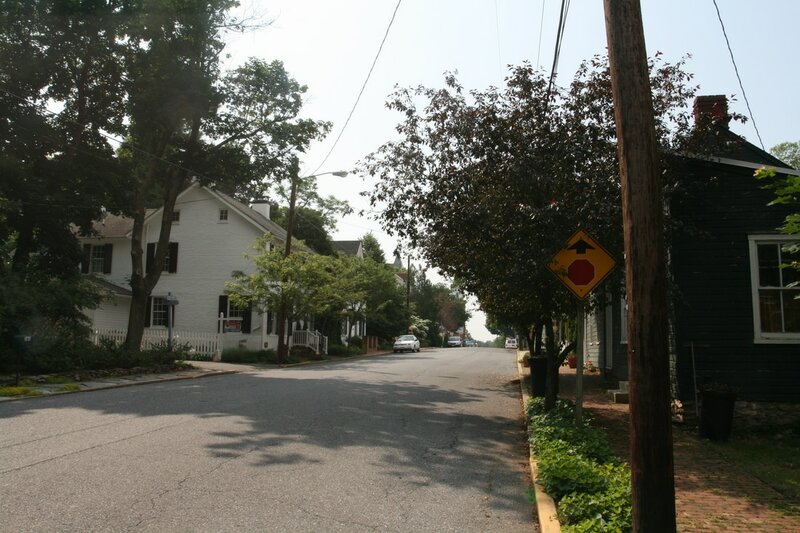 Locust Valley is a historic farming village located two miles north of Burkittsville along the base of South Mountain. The village took shape in the late-19th and early-20th century to serve the needs of area farmers and had a church, schoolhouse, general store, chicken hatchery, grain elevator, and butcher shop among other businesses and organizations. The Marker Family established several businesses in the villages (the main road through the village today is named "Marker Road"), including a general store opened in the early-1900s. In 1933, when the Marker's opened a new grocery store in downtown Frederick, they sold their Locust Valley store to Edwin and Mary Freed who managed it until its closure in 1965. 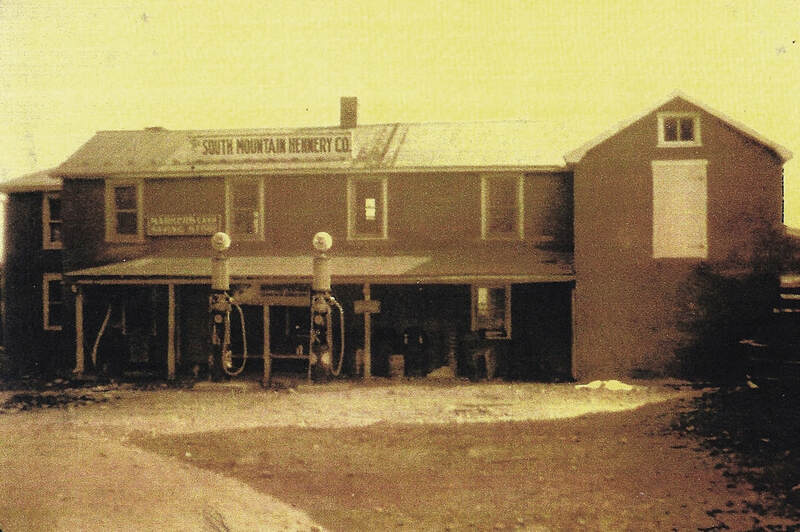 The billboard atop the store in the "then" photograph advertised the Marker's chicken hatchery business, the "South Mountain Hennery Company."